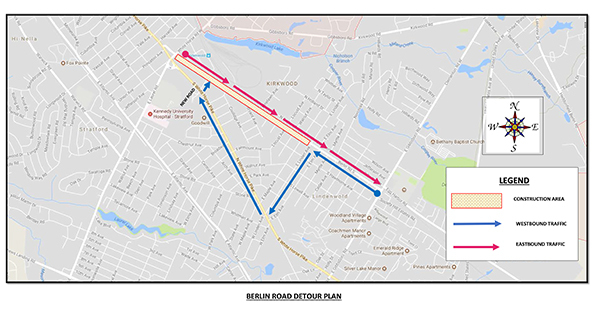 (Lindenwold, NJ) – The Department of Public Works will be milling and paving an expansive stretch of Berlin Road starting next week. The project will commence at 7 a.m. on Monday, July 31, and affect the portion of Berlin Road from the White Horse Pike in Stratford to Linden Avenue in Lindenwold. The work will be done during day time hours and may cause extra congestion and delays during rush hour traffic in the morning and afternoon. Through the duration of the project, westbound traffic will be detoured onto Linden Avenue from 7 a.m. to 3:30 p.m. while construction is underway. Eastbound traffic will remain open at all times during the course of the project, and two-way traffic will be open each night. Access to the adjacent Lindenwold PATCO Train Station will be maintained at all times from New Road. At this juncture construction is slated to be completed over the next several weeks, but could be extended depending on weather conditions and other unforeseen variables in the scope of the project.